Go to the below section. Sub Category: Environment > click the link "Servers"
Click the 'Save' button to save the configuration changes. Once the customizations are complete and saved, click the 'Activate Changes' button in the 'Change Center' panel to activate the changes. All changes have been activated. No need for changing the values in the $CONTEXT_FILE of the application tier. No need to bring down any services. Thanks for posting such good stuff! 1) When the application is running, from where will it take the value: $CONTEXT_FILE or WLS ? 2) In the future if autoconfig is run on the application tier, will the values in weblogic be replaced by the one in the context file or the context file will get updated with the values in the weblogic console. 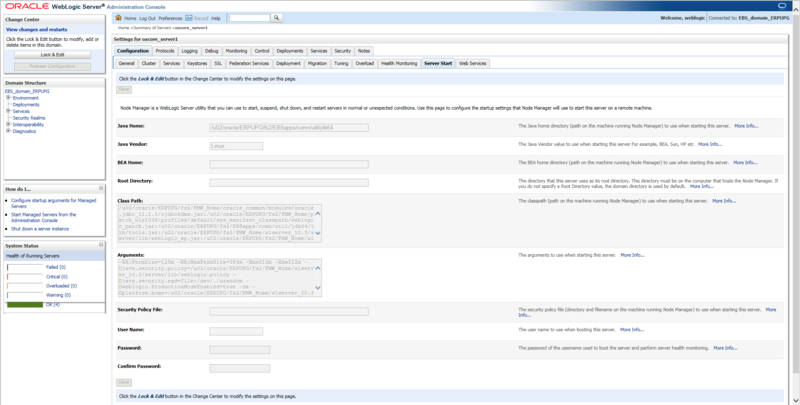 In EBS 12.2+ releases, JVMs are run in Weblogic OACORE managed servers. These OACORE managed servers are started when Weblogic is started and the parameters it uses to start a managed server are configured in the Weblogic console for each managed server. Therefore, the values used will be read from the values entered in the console for the JVM start parameters. Nicely explained in a simple manner. In the last line, you clearly mentioned that no restarts required. Without restarting the managed servers how managed servers will take the new values which we modified as arguments..
Once you save and then activate the changes, the arguments get modified. You can log out of the Weblogic Console and then login again to check if the values persists.